This is Dara from teach.craft.love. I am so excited to guest blog today for Allie's Creepy Crafty Halloween event. I will admit Halloween is not my forte but I am excited about hanging this little wreath out to celebrate. Hopefully it will inspire a few more ideas inside my home and I'm loving all of the other greats ideas that have already been posted! This is a pretty simple project. All of my materials are from The Dollar Tree and Michael's. I hope you like it! This is what the glitter looks like before it dries. Be sure to give it a pretty even coat. It's more or less like mod podge with the glitter already in it. I didn't wire all of the pieces. They seemed to stick without it but a few stuck out so I used floral wire to pull them closer to the wreath. Drape webbing around. Add as much or as little as you like! Tie your spider around the wreath. The one I bought (Dollar Tree) had an elastic band around the top so I just used that to attach the little guy. Paint letters. I added a coat of white paint and then two coats of the fantastic glitter paint in orange. Hot glue letters to wreath. Hang and creep out your neighbors! I hope you find inspiration from this wreath and have a very Happy Halloween!! P.S. Please ignore the poor picture quality/lighting. I finished this in the evening and didn't have a chance to take daylight pictures. Thanks for reading and I hope you'll stop by my blog sometime! check out more of her gorgeous wreaths like this cork wreath and fall rosette wreath, these book page wreaths, and this gorgeous house number and flowers wreath. She really is a master wreath-maker. 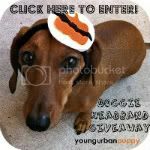 Click below to check out the giveaways going on right now! !